Editor’s note: This is the latest installment in our series of “Student Affairs Talk” podcasts. In it, Communications Director for Student Affairs Philip Sikes visits with various leaders from the staff and student communities. This week’s featured guest is Patricia Figueroa, assistant director for fitness and wellness within Campus Recreation. Figueroa is an assistant director for fitness and wellness in Campus Recreation and is in the process of recovering from a serious spinal cord injury suffered last summer on vacation. Patricia Figueroa came to Clemson University by way of Florida. She earned a bachelor’s degree from the University of Florida and a master’s from Nova Southeastern University in Fort Lauderdale. In 2014, she was hired as assistant director for fitness and wellness for Campus Recreation. In July 2017, she suffered a serious spinal cord injury after fracturing two vertebrae following an ATV accident while on vacation. The road to recovery has been long and arduous, but Figueroa’s largely positive outlook has helped tremendously. Following months of rehabilitation at Craig Hospital near Denver, Colorado, she returned to South Carolina late last year and has continued to work with physical therapists multiple times each week in Greenville. Just over a year removed from the accident, she returned to Swann Fitness Center at Fike and has resumed her role for Campus Rec. 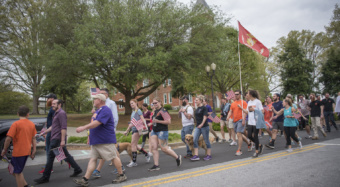 In this week’s podcast, Figueroa discussed what brought her to Clemson, the events that unfolded July 2 of last year, recovery, support and her triumphant return. Click the ‘Play’ button below to listen to the podcast.